Carrieanne Guthrie is an all American girl from the US state of North Carolina. After it was discovered that she was a lesbian, Guthrie left her job as a deputy sheriff and bought a one way ticket to the United Kingdom where she started her comedy career. For the last seven years, Guthrie has toured the UK and US keeping folks of all types laughing till they cry. With her charming southern accent, those big ole dimples, and infectious giggle, she will have you hooked on every y'all and BAM as she takes a jab at the world, and everything in it! Not only will she have you laughing til tears and bent over clutching your stomach from laughter pains, Guthrie writes and performs her own original musical comedy. From falling in love with a bank robber to a song all about gaff tape. Each tune will have you tapping your foot and will have you singing it days later. Whether you catch her hosting a gig, or you see her performing, no matter what, you will leave with a huge smile and a great time will be had by all, guaranteed! 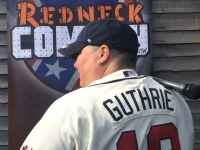 What was supposed to be a one night, one woman show; "Evening with a Redneck" ended up selling out the first night and a second sold out show was added.